Beach replenishment is ongoing and the beach remains closed south of Fielder Ave. The ongoing operation produced a wonderful swimming pool over the weekend which was enjoyed by many. Because sections of our beach are now closed, Ortley Beach badges will be honored in Seaside Heights. 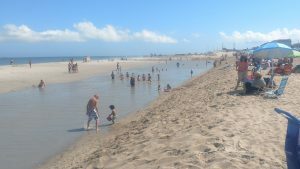 You can find the latest information on Beach replenishment and beach closures at the link below. As of July 31st the beach and entrances south of Fielder are closed. See the article below for the latest news article on beach replenishment in Ortley Beach. The link in the story that provides daily updates on which portions of our beach will be closed can be found on our OBVTA website Homepage and on “Useful Links” tab. Also, below is an article on why Ortley Beach had lots of brown clumps and dirty water this week. Below are three previous stories of interest concerning Toms River. Patch article on Toms River purchase of downtown hotel property.